The government considered pulling the home nations out of the football World Cup in 1982 during the Falklands War with Argentina, official papers show. In government papers newly released by the National Archives, it was suggested some players felt "revulsion" about competing along with Argentina. But Prime Minister Margaret Thatcher was warned withdrawal would be a propaganda "opportunity" for Argentina. England, Scotland and Northern Ireland did go to Spain for the tournament. Days after the Argentine invasion of the Falklands on 2 April 1982, a directive from sports minister Neil Macfarlane advised: "I urge no sporting contact with Argentina at representative, club or individual level on British soil. This policy applies equally to all sporting fixtures in Argentina." In a letter to Mrs Thatcher the following month, Mr Macfarlane reported growing doubts about the UK teams' attendance at the World Cup, starting in June. "Up until a week or 10 days ago I have taken the line that it was up to the Football Authorities to decide whether they should participate," he wrote. 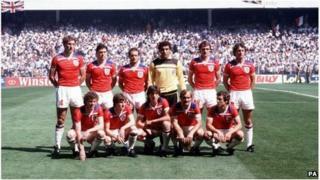 "However, the loss of British life on HMS Sheffield and Sea Harriers has had a marked effect on some international footballers and some administrators. They feel revulsion at the prospect of playing in the same tournament as Argentina at this time." He added that Fifa, international football's governing body, had made it clear that Argentina would not be pressured to withdraw from the tournament. "In this case no other country would follow us in withdrawing from the World Cup," Cabinet Secretary Robert Armstrong wrote to Mrs Thatcher days later. "Argentina would see British withdrawal not as putting any pressure on them but as an opportunity to make propaganda: the United Kingdom, not Argentina, would be the country set apart." Despite the discussions between the politicians, England, Scotland and Northern Ireland did all go on to compete in the tournament, although none of them met Argentina on the pitch. Scotland were eliminated in the first group stage, while England and Northern Ireland were both knocked out at the second group stage. Argentina exited the tournament after finishing bottom of a second round group won by eventual winners Italy. In August that year, after the end of the conflict, restrictions were lifted on sporting engagements with Argentina.